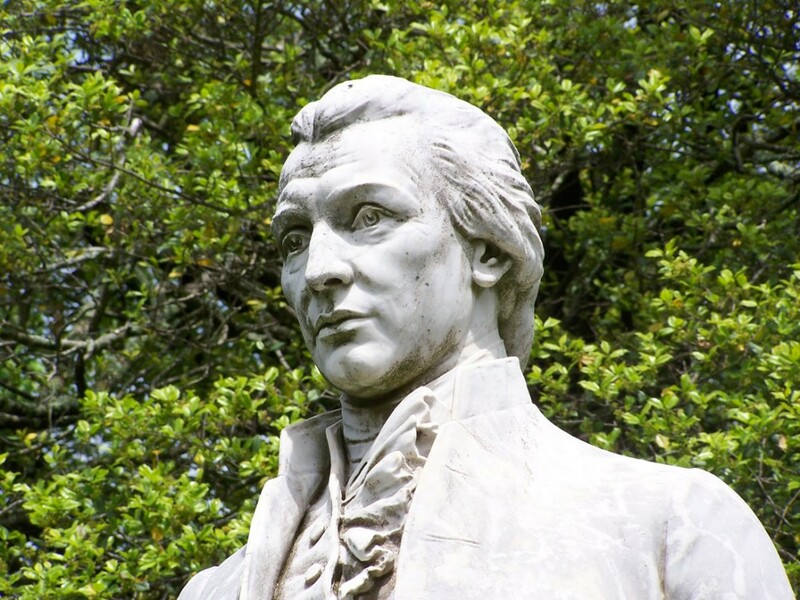 Born on April 28, 1758—in Westmoreland County, Virginia—James Monroe was the second of five children of Spence and Elizabeth Jones Monroe, “small” planters who raised tobacco on their farm of approximately 500 acres. Initially educated at Parson Campbell’s school in Westmoreland, the future President studied at the College of William and Mary in Williamsburg, Virginia, from 1774 until 1776, when he enlisted in the Continental Army’s Third Virginia Infantry Regiment. As an 18-year-old Lieutenant, Monroe crossed the Delaware River during Gen. George Washington’s December 1776 campaign, and was wounded at the subsequent Battle of Trenton. During the winter of 1777-78, Monroe camped with the army at Valley Forge. The following June he participated in the Battle of Monmouth, New Jersey. After leaving the army in January 1779, he continued to serve in the Virginia Militia and was promoted to Lieutenant Colonel. Monroe returned to Williamsburg and met Governor Thomas Jefferson, with whom he began to study the law in Richmond in the spring of 1780. Monroe and Jefferson became lifelong friends. The Monroes had three children—Eliza (born in late 1786), James Spence Monroe (born in May 1799, died in September 1800), and Maria Hester (born in the spring of 1802). For 24 years—from 1799 to 1823—the Monroe family home was Highland, Monroe’s Albemarle County plantation adjacent to Jefferson’s Monticello. Monroe’s fifty years of public service began in 1782 with his election to the Virginia General Assembly. Subsequently, Monroe served in the Confederation Congress and in the first United States Senate; was twice Minister to France, and later Minister to England and to Spain. He was elected to four one-year terms as Governor of Virginia, became Secretary of State for the remainder of President James Madison’s two terms, and also served as Secretary of War during the War of 1812. Monroe’s greatest achievement as a diplomat was his negotiation of the Louisiana Purchase in 1803. Elected President of the United States in 1816 and in 1820, James Monroe resolved long-standing grievances with the British, acquired Florida from Spain in 1819, and proclaimed the “Monroe Doctrine” in 1823. Optimistically labeled the “Era of Good Feelings,” Monroe’s administration was hampered by the economic depression brought on by the “Panic of 1819,” and by the debates over the Missouri Compromise that same year. Nonetheless, the Missouri Compromise—along with its admission of two new states—was one of Monroe’s political accomplishments, achieved through behind-the-scenes negotiation and consensus-building. Monroe supported the American Colonization Society which established the west-Africa nation of Liberia for freed blacks. Its capital was named Monrovia in his honor. Monroe himself was torn between his belief that slavery was an evil institution, and his fear of the consequences of immediate abolition. A nationalist in diplomacy and defense, James Monroe supported a limited executive branch of the federal government, distrusted a strong central government in domestic matters, extolled the advantages of industrious famers and craftspeople, and advocated republican virtue—the notion that the needs of the public should be paramount over personal greed and party ambition. A tall, slender man, Monroe distinguished himself throughout his career with his careful deliberation and cautious action. Known as a solid and able leader, Monroe, as President, assembled a particularly strong and talented cabinet. He helped define the young United States in a world dominated by numerous European powers, and contributed in multiple ways to the nation’s successful western expansion. James Monroe achieved distinction as a successful diplomat and administrator, and furthered our country’s strong national identity. James Monroe died in New York City—at the home of his daughter Maria Hester Gouverneur—on July 4, 1831, exactly five years after the simultaneous deaths of Jefferson and John Adams. In 1858 his body was reinterred at Hollywood Cemetery in Richmond, Virginia.